We not only provide excellent tree removal service, but we stay at your site long enough to clean up all the resulting debris. When we leave, your property is as clean or cleaner than it was when we arrived and always treat your home and yard with respect! We can also remove any debris you may have in your yard! After large storms huge pieces of wood and debris can be left in your yard that won’t be picked up by the county – we can help! We have the tools available to remove debris of any size! We provide safe and efficient debris removal services. 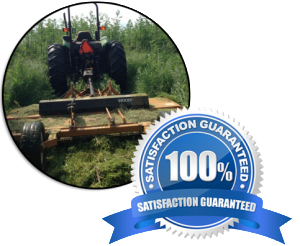 At TREECO, we have the ideal brush mowing equipment to remove brush, bushes and tall, overgrown grass from your lawn or lot. Of all the land clearing companies, we stand out for our attention to detail, skill and safe practices in clearing lots. When you have a large property that requires clearing, brush mowing is an excellent option. Areas that have become overgrown with tall grass, shrubs and small plants and trees can be cleared more easily this way. TREECO uses skid steer tractors for brush mowing, which are faster and more compact. This means your property will be cleared more quickly and efficiently than with traditional mowers. For brush mowing in Jacksonville and St. Augustine, contact TREECO. TREECO is one of the best customer choices when it comes to tree care service. we also offer comprehensive services such as tree trimming, stump grinding, general upkeep & tree removal Jacksonville & St. Augustine, FL. Get started today with our professionals. Debris Removal & Brush Mowing is reviewed as 4.9 out of 5.0 56 over the internet. TREECO is considered one of the top-rank tree service providers in St. Augustine & Jacksonville, FL. Need Professional Debris Removal or Brush Mowing?